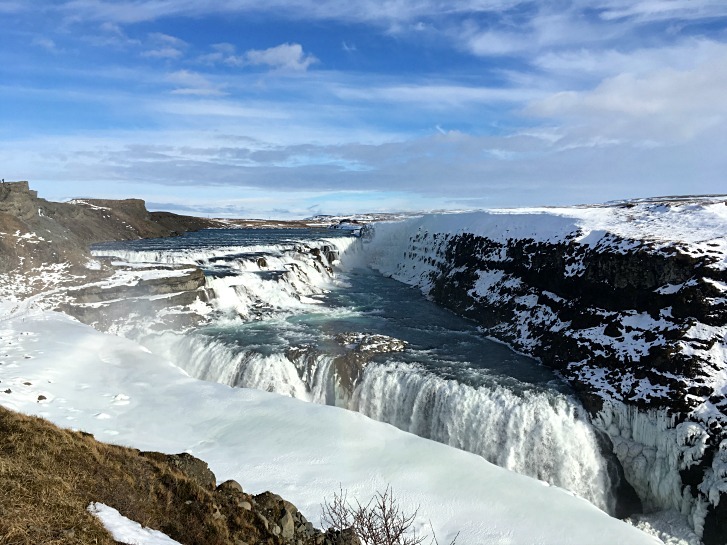 As many of you know, my husband and I traveled to Iceland this past March and had an amazing experience. We loved it all — the scenery, the food, the people, etc. It was incredible and we’d go back in a heartbeat. I imagine many of you wonder more about the food though and specifically, if it was easy to eat paleo there. The answer is yes, it was easy to eat healthy and within a paleo template, and I had no problems with the food situation. 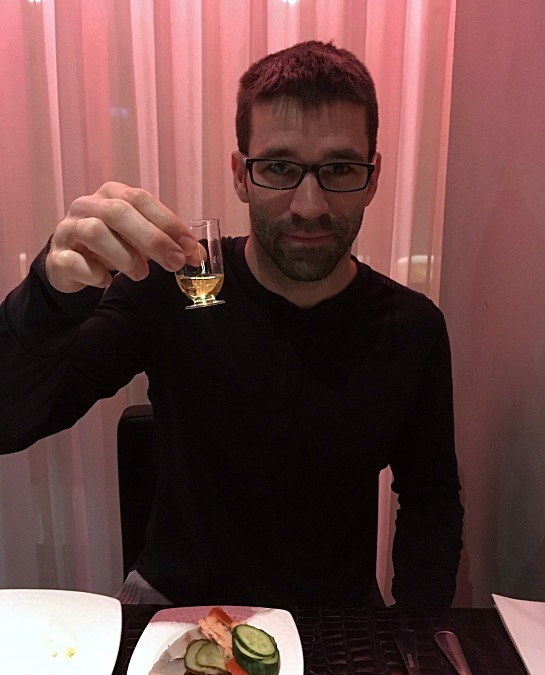 Eating paleo in Iceland is easily doable! I ate a lot of fresh Atlantic fish (Arctic char, ling, other cod varieties, salmon), pickled foods (beets, cucumbers, fish), root vegetables, potatoes, greens, tomatoes, and plain Skyr (traditional Icelandic yogurt). We ate a big breakfast every morning in our hotel, had a snack in the afternoon (generally macadamia nuts and/or an Epic Bar that we packed with us), and then went out somewhere for dinner. One night though, we had an awesome buffet dinner (followed by soaking & sauna) at the Laugarvatn Fontana, about an hour out of Reykjavik and afterward, went on a guided Northern Lights hunt (it was too cloudy to see them that night, but we did see them another night). There was fish, root veggies, salad, chicken, tomato basil soup, etc. It was delicious! You may or may not know this, but despite its cooler temperatures (it was mainly in the mid-to-upper 30s while we were there), Iceland actually grows a lot of its own produce in geothermal-heated greenhouses. 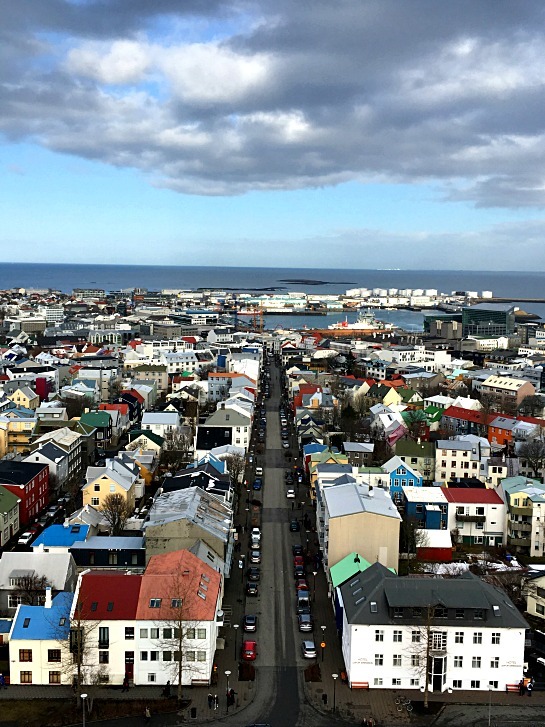 Additionally, Iceland is self-sufficient in producing meat, eggs, and dairy products. Iceland’s food is centered around purity and sustainability. They do not use hormones or antibiotics, and the use of herbicides and pesticides is very restricted. They also have very low pollution, and the water is so pure and fresh (no need to buy bottled water here — get it straight from the tap). Iceland for the win! 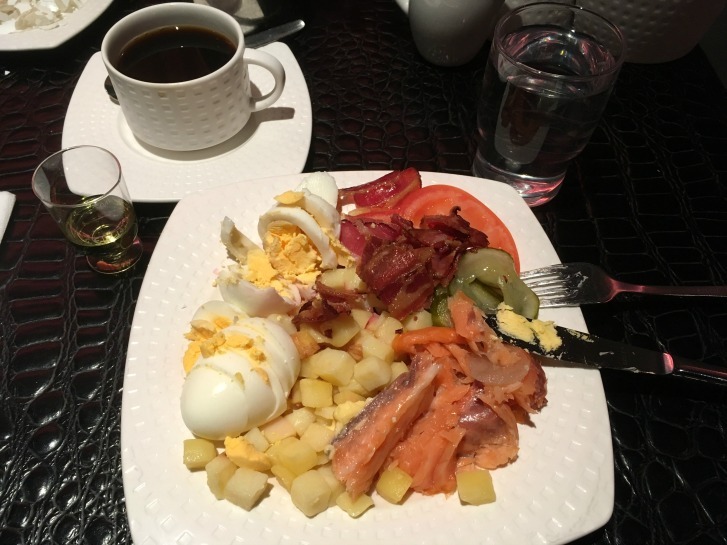 Meanwhile, my breakfast included lemon water, black coffee, smoked fish or lox, hard-boiled eggs, pickled veggies (sometimes a bite of pickled fish too), fresh tomato slices, potatoes, and a bit of bacon. 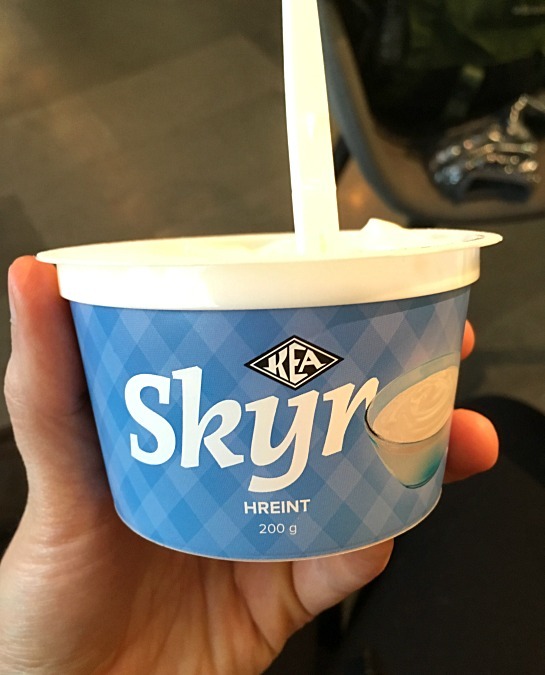 It’s not pictured below, but I usually ate half a banana and some plain Skyr as well. Oh, and a shot of Icelandic fish oil some mornings since they put the bottle and little shot glasses out each day. We looked forward to coming down to breakfast every morning in our hotel and having this traditional Icelandic spread. If you’re wondering, we stayed at Center Hotel Thingholdt in Reykjavik. It was a great hotel and fantastic location. Breakfast was included in the stay too. Glo: we ate here multiple times because the food was so amazing. Most everything is gluten-free and while there are a lot of vegetarian items (some incredible vegetable sides! ), a chicken dish is available as well. The food is SO good and fresh! And, don’t even get me started on their gluten/grain-free raw desserts. We tried many and all were incredible! 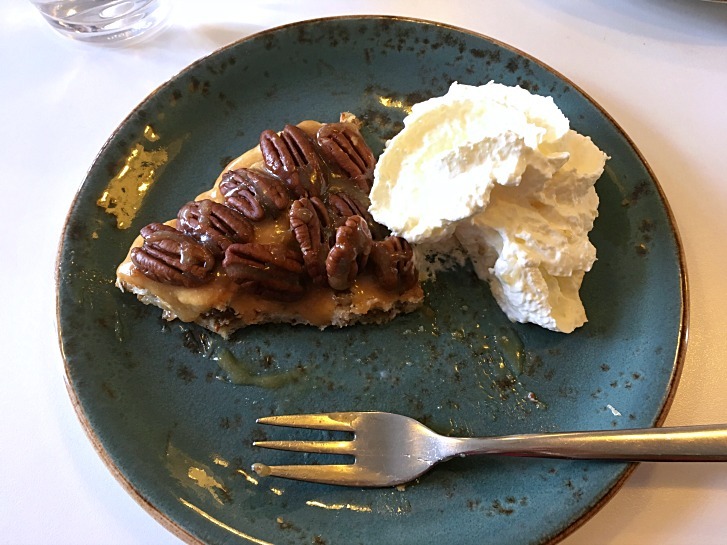 The second photo below is their pecan pie (grain & dairy-free – it was an almond and egg white base) with fresh whipped cream. I think I could eat that pecan pie everyday. It was unbelievable. Their raw tiramisu (don’t have a picture) was my other favorite. The first photo below was our actual first dinner in Iceland. 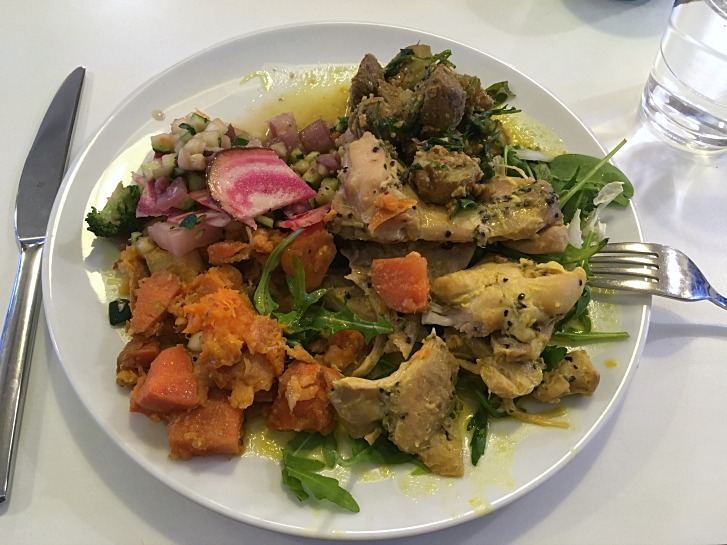 I don’t remember the exact details of what was on my plate, but there’s curried chicken, cold root veggies, mixed greens salad, cucumber salad, and cold potatoes with some sort of amazing raw sauce (I think it was either either almond or cashew-based and had coriander seeds in it). It’s definitely food that makes you feel good! 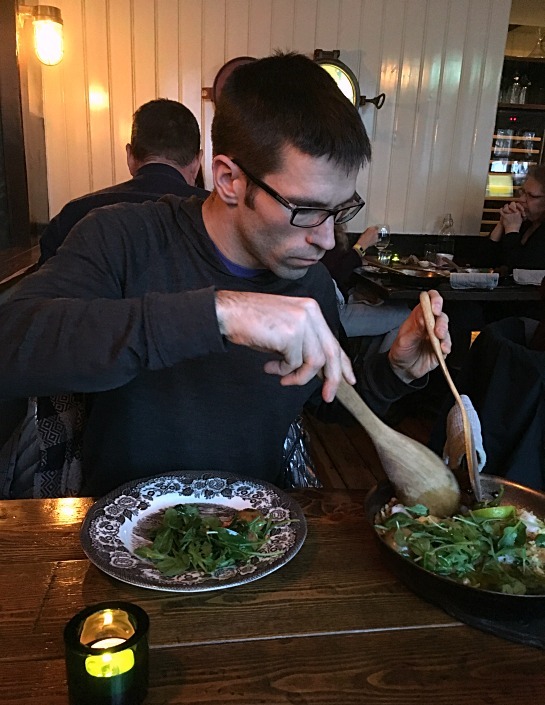 Messinn: We had our favorite meal of our whole trip here, and that says a lot because everything we ate was amazing. I had Arctic char that was served with honey, almonds, cherry tomatoes, lemon, and butter. It came in a big cast iron skillet with baby potatoes and a generous pile of arugula on top. Jesse ordered their cod, which had different elements, but was served in the same manner. He thoroughly enjoyed it as well. We went back on our last night (I planned to get the same thing again because it was that good), but they had to close for dinner that night due to some sort of unforeseen situation or emergency. We were so bummed! Bergon Mathus: this was a meal for two that we shared, which was not only delicious, but a really good deal too. 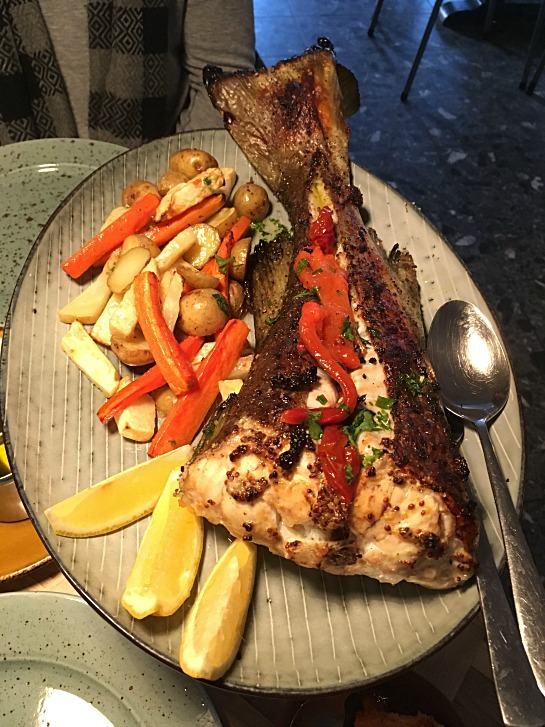 It was whole cod with roasted vegetables, and also came with two small sides of our choice. We went with a sweet potato mash and cucumber/tomato salad. The restaurant itself was adorable and had a lot of character. 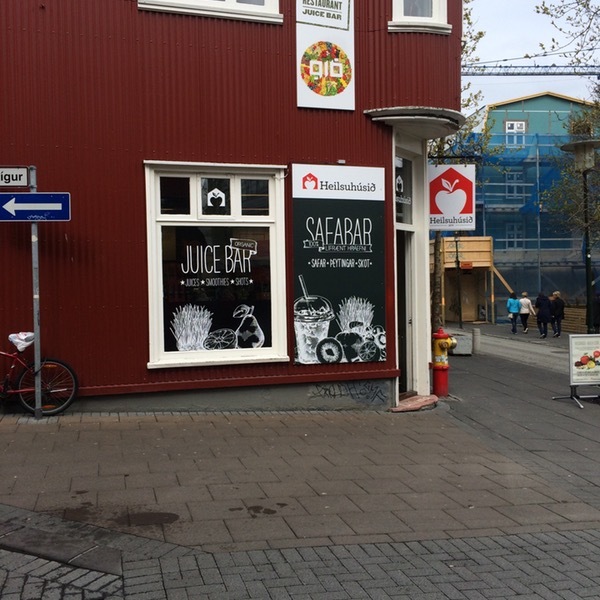 Helisuhusid: this is a great little health food store right next to Glo. We had packed a lot of our own travel snacks, but it was handy to have a spot to re-up our supply, as needed. Saeta Svinid Gastropub: we ate here one night for dinner and I had a lovely meal of ling with mashed potatoes, caper flowers, and Dijon-butter sauce. We were in close quarters with the table next to us and couldn’t help but strike up conversation with each other. We ended up having not only an enjoyable meal, but a great evening with an English couple. They were a hoot and our interacting with them is why I did not take a photo of my meal. Oh, and Jesse had a bun-less burger here, which he greatly enjoyed. Kryddlegin Hjortu: the soup and salad bar here is where it’s at, and this place is extremely gluten-free friendly. In fact, the majority of their menu is gluten-free or can be made gluten-free. And, all four soups on their soup bar are gluten-free too. The very fresh salad bar was almost all gluten-free, except for the homemade spelt bread and a couscous salad. But, these things were clearly labeled and obvious. We ate here two different nights and I got the soup and salad bar both nights. My favorite soups (which rotate, except for a homemade mushroom soup that they always have) included a vegan coconut curry soup and a spicy Indian chicken soup. The salad bar was loaded with fresh veggies, herb-infused oils, fish, fresh fruit, etc. Unfortunately, I never got any photos here, so you’ll have to use your imagination! Joylato: Three words: nitrogen ice cream! Pick whether you want an organic cow’s milk or coconut milk base, choose your flavor, and any mix-ins. They add the milk base to a mixer bowl with the necessary flavoring and turn it into ice cream in an instant with liquid nitrogen. Then, they mix in the topping(s) of your choice and serve it up with a homemade piece of gluten-free waffle cone. I had coconut milk chocolate ice cream with almonds and Jesse had coconut milk vanilla ice cream with homemade chocolate sauce. It was SO good and fun to watch the process. This place was busy though and took a while to get our ice cream. They have a line-up of 4-5 mixers, but can only make it so fast. When we were there, one person was taking orders and one person was making all the ice cream. 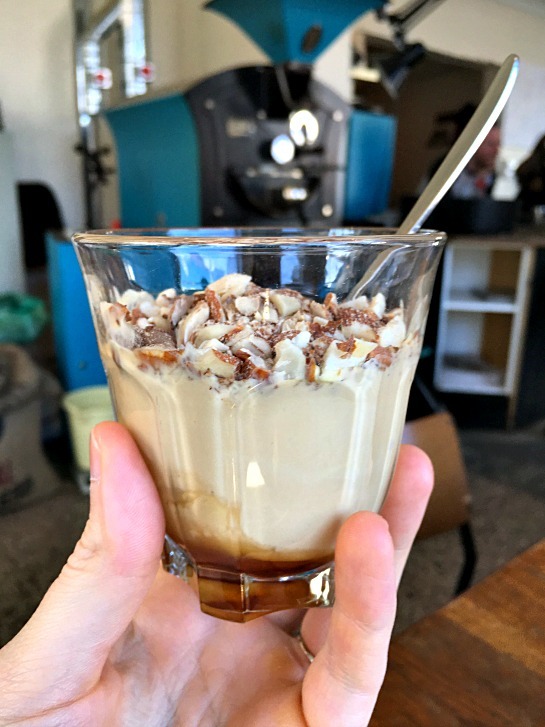 Reykjavik Roasters: homemade coffee Skyr yogurt with maple syrup and almonds. I got this twice while visiting – once on our first day as an afternoon snack and another time after soaking at one of the local thermal pools. Their coffee was also excellent! 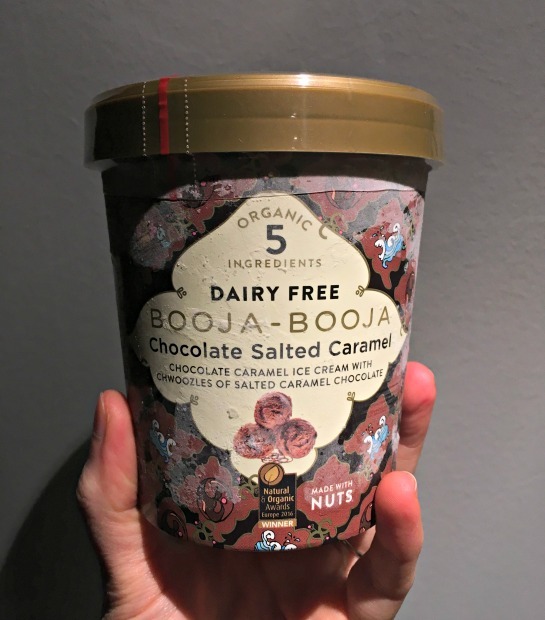 Booja Booja: this is an incredible England-made, non-dairy ice cream we found at the health food store above and also at a convenience/mini grocery store in Reykjavik. Most flavors are sweetened with agave, but the one below was sweetened with coconut syrup. These are a cashew base with 5 simple ingredients and no gums, preservatives, or weird stuff. It was so divine and creamy! 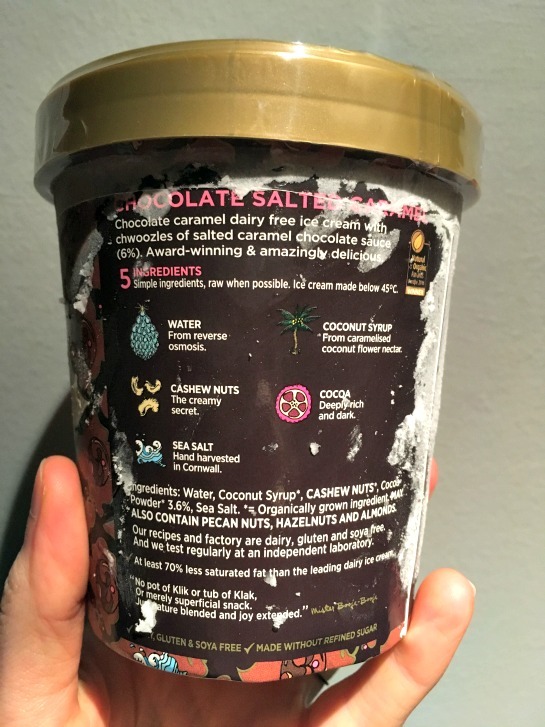 It tasted very much like a rich, classic chocolate ice cream and the smooth texture was all there. As you can see, it is easy to eat well in Iceland! I was always satisfied and did not eat a bad meal anywhere. Ordering was simple and I was always well understood when asking about things like gluten. I actually didn’t have to do any complicated ordering or even substitutions when dining out.